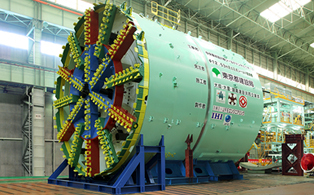 This is a shield machine for ultra-long distance and high-speed excavation, which was developed by taking advantage of the element technologies owned by JIMT, including technologies for improving the durability of bits and other devices, those for increasing the operating speeds of various devices, and those for automating segment assembly. 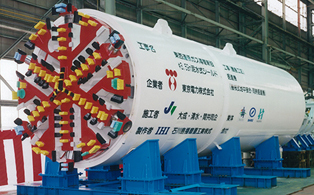 Further, this tunneling shield machine also features the double-cutter system, in which the inner and outer peripheries of the cutter head in the front (excavation surface) of the shield machine rotate separately from each other. This results in highly efficient excavation, with around 25% faster tunneling speed and 30% lower power consumption than conventional systems, in which the overall cutter head rotates as a single entity. 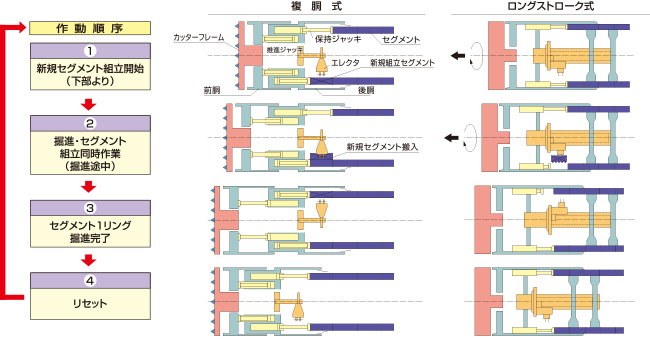 What adds to the speed of excavation is its mechanism, in which segment assembly takes place at the same time as tunneling. 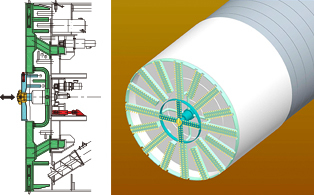 This shield machine comes with a mechanism that enables simultaneous segment assembly and tunneling. The result is a shorter construction period. Copyright 2016 JIM TECHNOLOGY CORPORATION. All right reserved.